Not many know that there is a lot more to West Bengal than the rich culture, lip-smacking food and magnificent temples. This eastern state of India is blessed with plenty of exotic wildlife. Our wildlife tour to Jaldapara and Gorumara national parks comprises of 5 nights and 6 days itinerary that offers you a great chance to see several animals and birdlife species. 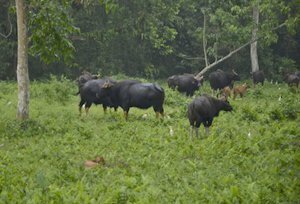 These include the one horned rhinos, elephants, gaur, spotted deers, Pallas's fishing eagle, jungle fowl, peafowl and partridges. The tour's specially designed itinerary lets you watch the best of West Bengal wildlife from close quarters. Upon arrival at NJP (New Jalpaiguri) railway station / Bagdogra airport meet with our representative and drive to Gorumara National Park. Established in 1992 as a national park Gorumara is situated in Jalpaiguri district of west Bengal. Upon arrival check into the wildlife resort. Evening free at leisure. Overnight stay at resort. Today we will explore the Gorumara National park by a 02 hrs Jeep safari. We will awake a little early and after morning tea it is time to enter the national park first time. Gorumara National Park is mainly famous for the one horned Rhino, apart from Rhino a number of spotted Deers, Bison's, Elephants and Gaurs can be spotted during your wildlife jeep safari. Later return to the resort for breakfast. After lunch we will again enter to the national park for wildlife viewing, this time we will spent our quite time at Jatraprasad Watch Tower. The watch towers are very popular in Gorumara and offer an excellent view of the forest, these watch tower are very significance for viewing wildlife from very close proximity. To spend some time at the watch tower is a very good idea. The popular watch tower of the national park is Jatraprasad watch tower; which is a tribute to the pet Elephant of forest department (Kunki). Later return to the resort for overnight stay. Today we will enjoy our safari in the forest of Gorumara to get a chance to move very close the wildlife animals. After one hrs long safari we will return to the resort for fresh-n-up and breakfast. Enjoy the day at leisure up to the lunch time or one can go for visit to Rhino observation tower, located near the forest bungalow. The salt reservoir just below the Rhino observation point is an ideal a perfect place to see wildlife as these wildlife frequently visit the reservoir for water. After lunch we will again visit the national park, this time we will enjoy a nature trekking to the national park. Later return to the wildlife resort for wildlife viewing. After breakfast we will leave for our second wildlife destination Jaldapara National Park. On the way to Jaldapara we will visit the South Khayerbari animal rescue center. The animal rescue center at Khayerbari is home to Tigers, Leopards which was brought from various circus troupes and zoos. One can enjoy a leopard safari in this center. Further we will continue drive to Jaldapara national Park, situated within the foothills of Himalayas. It was declared as a wildlife sanctuary in 1991, for the protection of the one-horned rhino. The park is flung by river Torsa and river Malangi. The sanctuary is mostly covered with tall grasses and comprises rich vegetation and a variety of wildlife. Upon arrival in Jaldapara check into the wildlife resort. After fresh-n-up we will explore the nearby tribal villages within the vicinity of the national park and will also enjoy a nature trail. This morning we will awake a little early and will move for a jungle safari in Jaldapara national park for wildlife viewing. Later return to the resort for breakfast. After breakfast enjoy the atmosphere and the glimpse of nature around the wildlife resort. After lunch we will again visit the National Park. This time we will enjoy our jeep safari to the national park to explore its exquisite beauty of the vast grassland. 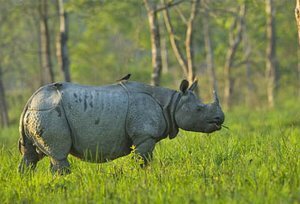 The national park is famous for the one one-horned rhinoceros and holds the highest rhino population in India after Kaziranga National Park. The other fauna found in Jaldapara are tigers, elephants, deers, sambar, wild pig and bison and a number of avifauna are also found in Jaldapara which make it a paradise for bird watchers, the avifauna are the Bengal Florican, crested eagle, Pallas's fishing eagle, jungle fowl, peafowl, partridges, and lesser pied hornbill etc. Morning after breakfast we leave for Bagdogra / NJP to connect with onward destination.